Whether you have a child with a diagnosed attention disorder, a student with a learning difference, or someone at home who simply benefits from soothing, repetitive action, a fidget toy could be a wonderfully calming tool. Most fidget toys engage a couple of senses by spurring concentration through repeated kinetic movements or simple sounds. With school-aged children, a discreet fidget toy might help ease the anxiety of test day or working in a new peer group. Involve your little one in the creation of the fidget item itself to increase connection and ownership. Give these simple do-it-yourself fidget toy ideas a try to increase your student’s overall productivity and positivity—both in the classroom and out. 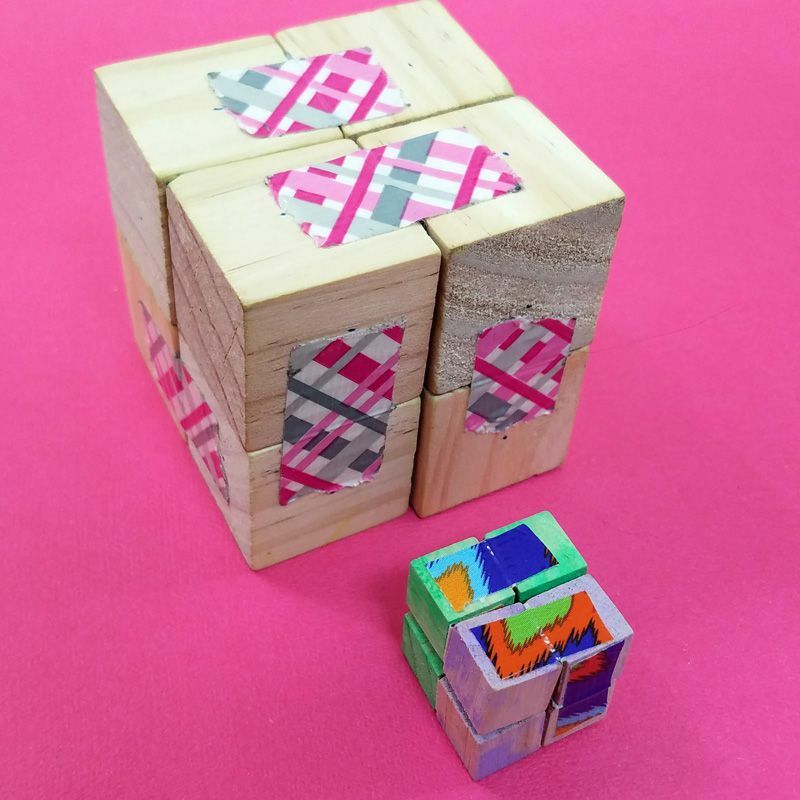 Plain wooden cubes and a length of duct tape are all you need to construct a palm-sized puzzle toy from Moms and Crafters. Tape the blocks together, allowing them to bend accordion-style over each other. Kids can manipulate the blocks into different arrangements while calming themselves. Involve little ones in the creation of the infinity cube by allowing them to paint and decorate (washable marker shows up well on light raw wood). Build a few different setups using different sized cubes; have one ready for your student's backpack as well as in the playroom. Capture the calming motion of a fidget spinner, no hardware (or trip to the dollar store) required. Practice following step-by-step instructions with your little ones to create these origami ninja stars from Red Ted Art using plain construction paper. These are more discreet than their light-up, plastic counterparts, so encourage your kid to keep one handy for stressful situations. When learning to write, young students might have an especially tricky time adjusting to the pressure of the pencil, the thinness of the paper, and practicing the necessary controlled hand movements. Encourage kids to explore mobility through this handy desk fidget tool. This toy comes together with a pipe cleaner, a craft stick, and a few plastic beads. Kids can smoothly move beads from one end to the other, which will help calm them during a tricky task or while practicing fine motor movements for future careful schoolwork. This homemade toy does require a bit more hardware than the others, but it’s a unique, calming trinket that utilizes a few small simple machines. This makes for the perfect opportunity to involve your budding engineer or architect. Follow along Instructable's tutorial to learn how attach two soda bottle tops to a handmade rotating gear (if that’s too ambitious for you, source one from a hardware store), which allows them to spin independently. Then you'll add a joystick setup (a bolt and a spring) and a mouse wheel (a marble) to either end, for a multi-functional, busy, handheld fidget. Carefully fill a durable, transparent balloon with smooth glass pebbles, the kind used for indoor faux plants, or water pebbles used in vases for real plants. The more colorful the better, then add water. A funnel is particularly handy when it comes to filling a small balloon, especially if you’re working with children. Tie the balloon securely, and it works perfectly as a textured stress ball. Short on pebbles? Try smooth beads, marbles, or stones instead. As kids get used to holding a writing utensil for hours at a time, it’s often helpful to add weight and dimension to the tool. This can help increase your child’s self-awareness and focus on their current assignment. Use store-bought gummy grips as stoppers, then add beads or metal nuts to add mass, color, and texture to pencils and pens. The added interest to a simple school supply can help bring a sense of positivity to homework, which is always a win during those often tricky after school hours. Soft, cozy fidget toys are especially helpful for kids who derive a sense of security from their fidgets. Try this do-it-yourself maze bracelet that children can wear daily and use when feeling anxious. While a sewing machine makes this a quick afternoon craft, hand stitching works just as well. The stitches don’t have to be perfect, so this project provides a great opportunity to teach kids to sew. Select a comfy flannel or knit fabric (recycle a torn sweatshirt or old towel) to make this bracelet super comfortable and comforting. These pre-teen approved stress balls are on-trend and ultra squishy. They're insides are filled with homemade slime. Mix up a batch of slime from your favorite recipe, this tutorial from Hello Creative Family provides you with their top choice for slime, and carefully fill a yellow balloon. 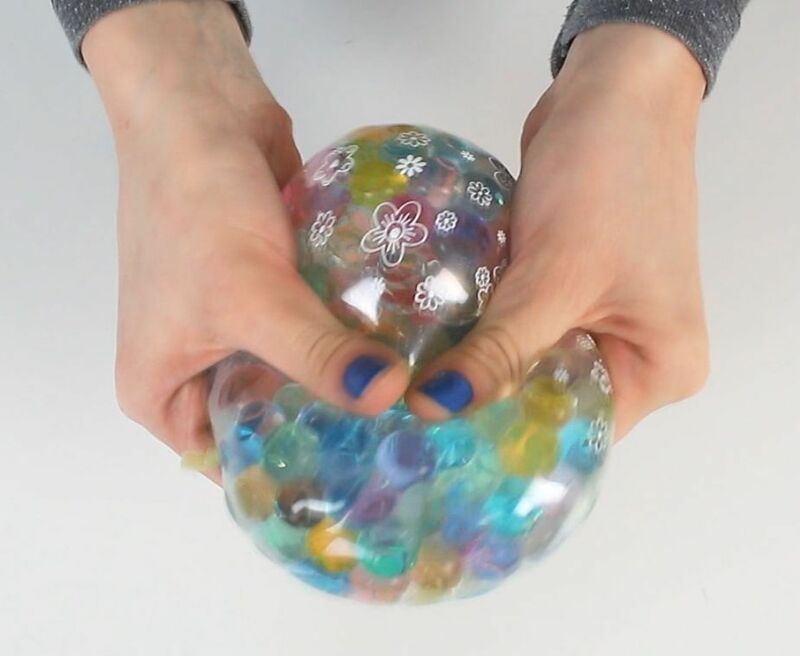 This specific stress ball instructional also has a hack for covering up the balloon knots that stick out when making these squishy toys. Add emoji expressions using a printer and a Cricut machine, or use a stencil and permanent marker to draw them directly on to the balloon. Pro tip: Use a funnel to fill the balloon with slime. You’ll decrease the mess and be able to fill more stress balls quicker. There’s no doubt that kids love to squish and knead things, so why not turn slime time into a focus exercise? Mix a homemade batch of putty with the ingredients from Natural Beach Living's tutorial, then encourage kids to color and scent their own. Lavender essential oil is perfect for this project; add a few drops and it’ll calm and soothe as kids manipulate the putty. Pack a small amount of putty into a reusable plastic container and send it to school with your student to knead while concentrating in class. Another discreet option for a classroom fidget, this floating bead bracelet is comfortable and soothing for an uneasy student. String plastic beads along a silk cord (it won’t bother sensitive skin), then knot it around a wrist. You can see the exact beading pattern on Lines Across' tutorial. Kids can spin the beads easily (and silently) while working on assignments and projects. Make a few using different colors and patterns so children can select a bracelet for school each day. Just be sure to knot them loosely enough to slip on and off the wrist. Grab a few discarded metal pieces (in this case an old bike chain and empty key rings), then link them together into reworkable formations. Small rubber bands help this one come together. You can secure the metal pieces by wrapping and tying. This is also a great project for encouraging kids to ideate and create their own metal fidgets. Simply provide the supplies, and challenge little engineers to design and build their own handheld toys. Kids will love participating in the creation of these cute, school-friendly fidget toys. Follow Craft Tea's instructions for using pipe cleaners, pom poms, and googly eyes to make these funky little toppers. Although these fidget toys are small, they still provide enough kinetic interest for easily distracted kids. Another bonus? These toppers are completely silent when they wobble, so they’re teacher-approved. Instead of turning to dirty fingernails and pen caps as chewing fidgets, provide kids with a wearable, chewable piece of jewelry. A sturdy shoelace makes certain a homemade necklace or bracelet won’t break, and cloth-covered wooden beads are easy on the teeth. Lemon Lime Adventures' step-by-step tutorial will show you how to string and wrap the beads so your student will have something he or she can discreetly nibble on. Jump on the squishy toy trend and create some simple fruit-shaped handhelds with your child. Buggy and Buddy will show you how to trim a small bit of memory foam (sharp scissors are necessary, so this part is best left to adults) into fruit shapes. Kids can help paint and decorate each shape. Try watermelon slices, apple halves, and bunches of grapes. Little ones can squish, release, and re-squish their toys when feeling uneasy. Hint: an older memory foam pillow can absolutely be upcycled into fun toy squishies. This do-it-yourself couldn’t be easier. All of the Boys' tutorial will demonstrate how to tie a couple of metal nuts onto the ends of a length of paracord for a fun, swingy toy. Then encourage little ones to practice flipping it between their fingers. Experiment with different lengths and thicknesses of cord, as well as different sized nuts. This is a perfect, inexpensive pocket-sized toy that kids can carry around for whenever they start to feel a bit anxious (or just bored). This toy is best for kids who are a bit older, as they'll know when to responsibly use it and not accidentally hit it on something (or someone) during school.